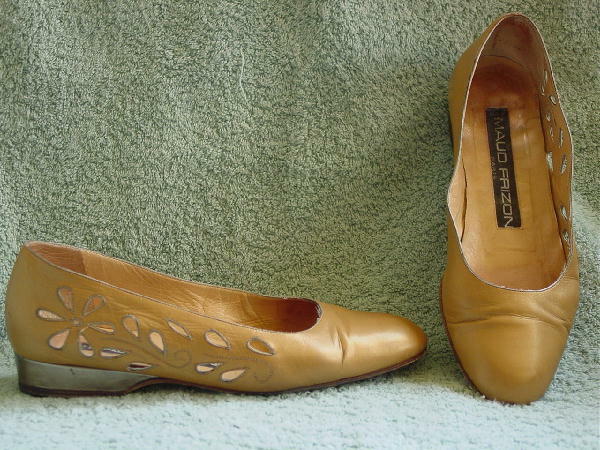 These vintage rounded toe leather shoes are by Maud Frizon. They're in a golden honey mustard color and have sandy color leather linings and insoles. The outer side of each shoe has a cutout pattern of a daisy and petals. There are golden bronze color heels. There are a few scuff marks. The heels have rubber guards. The vamps have some creases. They're from an Asian model who wore them a lot. Her feet grew after she had a baby.